April 26, 2018 -- China's top legislature began its bimonthly session on Wednesday, with amending the Criminal Procedure Law and several other pieces of legislation on the agenda. 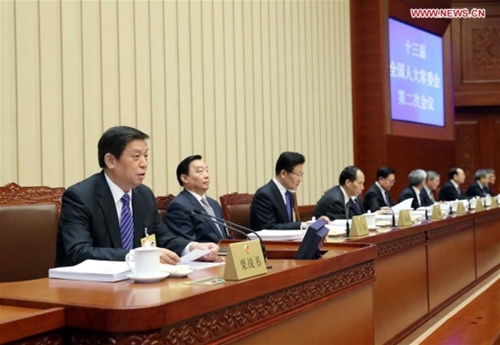 Li Zhanshu, chairman of the National People's Congress (NPC) Standing Committee, presided over the meeting, which was attended by 169 committee members. A highlight of the session is the draft revision to the Criminal Procedure Law. Shen Chunyao, chairman of the Commission for Legislative Affairs of the NPC Standing Committee, said the revision would codify default judgment, and leniency for guilty pleas, as well as expedite trial practices. The default judgment, for example, will be used against suspects and defendants in corruption or bribery cases who have fled abroad as authorities step up the fight against corrupt fugitives. The legislation plans to strengthen efforts to catch overseas fugitives. "China's international hunt of fugitives and stolen assets has made great progress since the 18th National Congress of the Communist Party of China. It has won broad support from the public," Shen said. According to a government white paper, from 2014 to mid-October 2017, 3,453 fugitives were brought back from more than 90 countries and regions. Illegal assets worth 9.5 billion yuan (around 1.5 billion U.S. dollars) were recovered. "In the past, fugitive officials can only be tried after being repatriated," said Chen Weidong, a professor at Renmin University of China. "With default judgment in place, they will be punished by law even if they escape to the farest corner of the world." Leniency for guilty pleas allows suspects and defendants to be considered for mitigated punishment if they voluntarily confess and sign affidavits. Also added is the practice of expedited trial at primary people's courts, involving mostly petty criminal offenses. Both leniency for guilty pleas and expedited trial have been tested in pilots. The revision will also adjust certain provisions of the Criminal Procedure Law to avoid conflict with the Supervision Law. The Criminal Procedure Law was created in 1979 and underwent two major revisions, in 1996 and 2012. A draft law on "people's assessors" and another to protect the reputation and honor of heroes and martyrs were tabled to the legislature for second readings. The first legislation will give assessors a bigger role to play, including in cases in which the death penalty is possible and cases which cause "severe social impact." Zhou Guangquan, deputy chairman of the NPC Constitution and Law Committee, said the bill was now ready for a vote. The second legislation adds punishment for people who "glorify wars of invasion" and disturb the social order. Hu Keming, another deputy chairman of the NPC Constitution and Law Committee, said the bill was meant to protect public interest and promote socialist core values. "The legislation is very necessary and the text is now mature enough to be adopted," Hu said. President of the Supreme People's Court Zhou Qiang briefed the legislature on a decision to set up a special Shanghai Financial Court to deal with finance-related commercial and administrative cases in the city. "The court will bolster the international influence of China's financial justice, forestall financial risks and steer the financial sector to serve the real economy, and to build Shanghai into an international financial center by 2020," Zhou said. Justice Minister Fu Zhenghua explained a motion to revise seven laws. The revisions will bring the laws in line with a State Council institutional reform adopted at the NPC annual session in March. On Wednesday morning, the top legislature also heard reports on environmental protection, supply-side structural reform in agriculture, rights protection for overseas Chinese and a pilot reform of the people's assessors system. Panel discussions were held on Wednesday afternoon. Li, the NPC Standing Committee chairman, also took part in the discussions. The legislative session will run until Friday.